Posted on September 17, 2015 by Appropos / This entry was posted in Informative. Bookmark the permalink. Pax 2 Party Mode: All four lights are different and cycle through different colors. There appears to be a rhythm/pattern to the color cycle. Lip sensor activation increases speed of color change. Oven is on. Standby timer extended to one minute between sensing movement or lip. Pax 2 Party Mode Timer: All four lights are stationary. When the Pax 2 is moved the lights jump into a random light configuration, occasionally one or more of the lights are very dim or off. If the Pax 2 is held face down the lights flicker and change rapidly. Lip sensor activation makes the lights flicker and change rapidly for up to 10 seconds. At 10 consecutive seconds of lip sensor activation the lights freeze. Removing your lips and replacing them starts another 10 second flicker display. Oven is on. Standby disabled. Pax 2 Party Mode Light Painting : In this mode all four lights show the same color and cycle through colors while the Pax 2 is being moved, when still, the lights are off. Waving the Pax 2 through the air yields a color changing stream of light. The heater can be turned off in this mode by selecting a fifth available temperature, all four lights blue. Pax 2 Party Mode Color Carousel: The lights react to movement and position of the Pax 2. When laid flat the Pax 2 shows blue. When facedown, an orangish-yellow. When held upright, the Pax 2 and by giving it a little circular flick, the colors begin to cycle with a noticeable pattern. The colors can be seen transitioning from one light to the next, as if there is a big globe of colors inside and the lights reflect whichever colors face forward. The heater can be turned off in this mode by selecting a fifth available temperature, all four lights blue. Pax 2 Party Mode Simon: Spin the Pax 2 until all four lights flash white three times. The simon game will begin. Hold the Pax 2 face up, horizontally in front of you. Observe the pattern displayed on the lights, then repeat the sequence by leaning the Pax 2 towards the appropriate light. The heater can be turned off in this mode by selecting a fifth available temperature, all four lights blue. 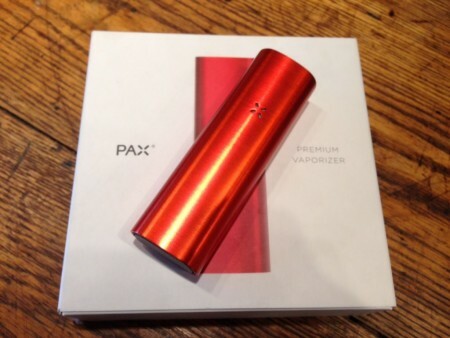 Pax is arguably the most well-known vaporizer in the industry. The intuitive improvements of the Pax 2 in comparison to the original Pax really sets it apart from its predecessor and other vaporizers on the market. The Pax 2 party modes are fun. But the lights are also informative, displaying the temperature of the device. There are four different temperature settings which align with the amount of lights on the front. There is also an auto-cooling feature which relies on the device’s motion and lip sensors. These motion sensors are more than simply convenient. They help the device achieve thirty percent longer battery life than the original Pax. The original Pax could last for about five sessions. The Pax 2 can go for seven to eight, which is top of the line as far as vaporizers are concerned. The device goes into standby mode when it knows that it’s not in use. The lip sensor also stops cooking your herbs when it realizes that there is no lip contact being made with the mouthpiece. It decreases the heating of the herb nine degrees for every twenty seconds of absent lip contact. Other than these intuitive features, one of the main improvements of the Pax 2 is how much easier it is to clean. The original device would stop producing vapor once it got clogged. This device can go for like ten days without needing a cleaning, and it doesn’t require you to remove the front power button to clean it either. All-in-all, the Pax is a great device that lives up to its popularity. There are devices out there that provide more control and better vape as far as ripping is concerned. But the Pax 2 is a great device for somebody looking for a reliable vaporizer that is easy to use and not going to be a hassle to take care of. Combined with Pax’s ten year warranty, it’s hard to go wrong with a Pax 2.